You are here: Home The Market Is Recent Volatility Cause For Concern? Comments Off on Is Recent Volatility Cause For Concern? In the graph of the S&P 500 below, if markets moved in a linear fashion, managing risk would be much easier. It would be easy to leave our investments alone between point A and point B. 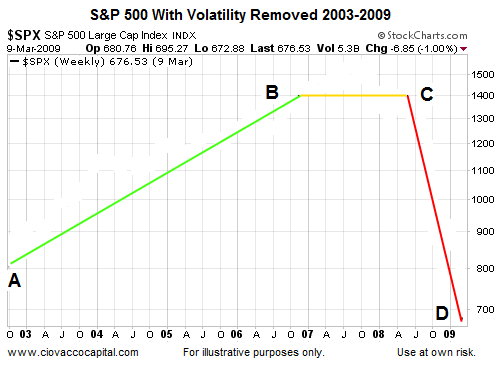 It would have been easy to spot that something was changing between points B and C, and much easier to discern something had changed for the worse between points C and D.
Unfortunately, markets are volatile. Therefore, from a risk management perspective it is helpful to have tools that help discern between “volatility to ignore” and “volatility to respect. This week’s video covers the topic in the context of recent volatility in the U.S. stock market. Could not parse XML from YouTube Good Sign For The Economy? Halliburton Co (HAL.N), North America’s top oilfield services provider, said it would add fracking equipment and crew to take advantage of higher demand in the region, signaling an industry-wide recovery after a two-year slump. 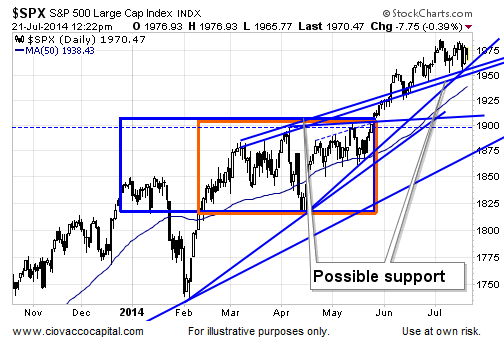 Even with the S&P 500 down as much as 12 points in Monday’s session, support shown in the chart below remained in place. As diplomatic pressure for a cease-fire mounted on the conflict’s 14th day, the Palestinian death toll topped 500 and the number of Israeli soldiers killed hit 25, more than twice as many as in Israel’s last Gaza ground operation in 2009. Two Israeli civilians have also died from rocket and mortar fire. After days of obstruction, Russia-backed separatists in eastern Ukraine permitted Dutch forensics experts on Monday to search the wreckage of the downed Malaysia Airlines jetliner destroyed by a surface-to-air missile, allowed bodies of the victims to be evacuated by train and agreed to give the plane’s flight recorder boxes to the Malaysian government. The movements, four days after Malaysia Airlines Flight 17 exploded and crashed in an eastern Ukraine wheat field, came as President Vladimir V. Putin of Russia faced a growing international clamor to clear the way for a full and unimpeded investigation of the disaster. The evidence we have in hand continues to call for a prudent allocation to U.S. stocks (SPY), and leading sectors (QQQ). However, with markets nervous about the Fed, geopolitical events, and earnings, flexibility remains as important as ever. Tuesday brings reports on inflation and housing. Never a dull moment.